The Thai spicy peanut sauce worked really well in the Thai chicken ‘mole’ earlier in the week and why I was enjoying it I was thinking of other ways that could use the peanut sauce in a Thai/Mexican fusion. With the chicken being covered in the peanut sauce and melted cheese, the first thing that came to mind was enchiladas, the Mexican dish where tortillas are stuffed, covered in sauce and cheese and baked to perfection. I was thinking that a filling consisting of shredded chicken along with some vegetables including red pepper, bean sprouts, carrots and cilantro would be really nice especially when some of the spicy peanut sauce was mixed into it. With the filling made, all that was left to do was roll the tortillas up, cover them in peanut sauce and cheese and bake them until the cheese melted. The spicy peanut sauce and melted cheese flavor combination is such an amazing one and the juicy vegetable and chicken filling finished off the enchiladas perfectly! I garnished the enchiladas with some chopped roasted peanuts, cilantro and birds eye chilies. Add the green onion, carrot and bean sprouts and saute until tender, about a minute. Mix in the chicken, cilantro and 1/2 cup of the peanut sauce. Spread some of the peanut sauce over the bottom of a baking dish. Place some of the filling in a tortilla, wrap it up and place it in a baking dish. Repeat for the remaining tortillas. Pour the remaining peanut sauce over the enchiladas and sprinkle on the cheese. Bake in a preheated 350F/180C oven until the sides are bubbling and the cheese is melted about 20-30 minutes. Serve garnished with chopped peanuts, sliced chilies and cilantro. Wow, this is anything but closet cooking! I love your blog, so much exotica. This Thai enchilada is exactly what I wish I could reach into the screen and eat right now. I am LOVING the thai inspired themes of these great recipes you have going on lately!! yum! What a fun spin on enchiladas! They look delish! reminds me of one of my favorite California Pizza Kitchen creations – the thai chicken pizza! Oh, I love how you blend cultures together in a dish. You are truly amazing. Love your "fusion" enchiladas! I can definitely see how the spicy peanut chicken would work this way. Looks great! So good! Two world collide in one fantastic recipe. This looks fabulous – I can't wait to whip up a batch of these- just what I need to get me out of my summer food rut (grilled everything:). OH MY GOSH, these look SOOO GOOD!!!!!!!!! Bravo! Good Gracious!!! That looks divine. Yummy looking again, but how many calories???? I am reading your site with interest as I too am cooking in a closet size kitchen. It works though! What a great idea! So creative and delicious! I like this roll you're on! Yum….I think it's brilliant creation! Interesting! I never really thought about the combination of peanut sauce and cheese before. See you your next recipe! You have no idea how totally enamored with this I am! I'm pretty sure I said that with the thai mole as well…but they are both really truly amazing. Oooh La La! Awesome recipe! This looks fabulous Kevin. You can't go wrong with peanut sauce I think! What a creative enchilada… The idea of peanut sauce and cheese sounds interesting! I always find your flavor combination to to be delicious. I think these must be made. Thanks so much. That looks delicious!! And, I wanted to let you know that I nominated you for a blog award! Tasty looking enchiladas. Excellent photo. I am always fascinated with Thai dishes. Especially their spicy dishes. 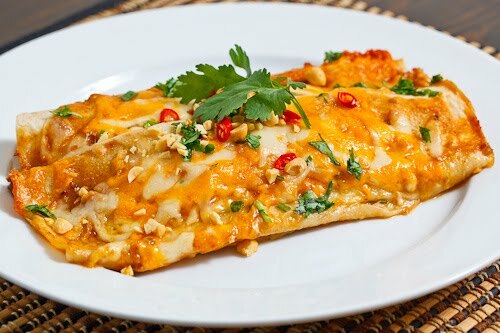 This Thai Spicy Peanut Chicken Enchiladas looks so good. I wish I can try this one. These look fantastic. If you really did create these in a closet-sized space, you are something of a culinary hero. I shall have a go at making some of these over the weekend for the girlfriend and I. Many thanks. This is a must try. Definitely a people pleasing enchilada! You are so creative, another lovely and delicious dish. fabulous thai/mexican fusion here! love it!! Such a lovely blend of two of my favorite cuisines! J'adore! I am a sucker for enchiladas, and these sound great! The Thai-Mexican fusion is very creative. We eat lots of Mexican. We eat lots of Thai. This was a no-brainer choice to make and it was delicious! Thanks for posting! I love fusion recipes… and I think this combo of Mexican and Thai (two of my favorites) is brilliant! I made a version of these for my family, and we all absolutely loved it. Thank you so much for sharing. You are obviously a very talented chef. This might be the best thing I have ever made. Ever!!!! This was awesome. I've been wanting to make something similar for a while, but haven't had the nerve to make up a recipe myself. Thanks so much! I made this dish last night and it was absolutely delicious!! I used your recipe for the peanut sauce as well, and it will now be my go-to peanut sauce recipe. Thai & Mexican are two of my favorite cuisines, and the combo you came up with in this recipe is a hit. Even my fiance', who typically doesn't care for anything other than meat & potatoes or Italian food, couldn't stop raving about this. I love your blog & also follow you on Pinterest (I'm jthomps8 if you'd like to follow me), thank you so much for sharing your wonderful recipes! Made it earlier this week and it was AMAZING!!! I wasn't sure how it would turn out but the spicy peanut sauce went so well in an enchilada! Instead of regular cooked chicken, I made your satay chicken recipe and stuffed it in instead. Yaoli: I am glad that you enjoyed it! I am so addicted to that spicy peanut sauce and I really like how it works in these enchiladas! Using the chicken satay would add that much more flavour! I finally just got around to making these last night. YUM! So GOOD! Thanks for the awesome recipe! I am currently eating the delicious leftovers at the office. I'd say this is one on my list to definitely do again very soon.